Figure 1. Microscope slides by C.S. Poulter. The address on each provides a range of dates for their preparations: the slide from Wallington was made ca. 1899 - ca. 1904, and the slide from Bexley was made between ca. 1904 and the time of his death in 1930. This amateur microscopist left very few records of his hobby, other than his slide collection. Poulter joined the Quekett Microscopical Club on June 21, 1895, and remained a member until the end of his life. The Club’s Journal records only one exhibit by Poulter, a slide of “wing of small tortoiseshell butterfly” at the annual Conversazione on May 4, 1897. Christopher was born on June 4, 1871, in Southwark, London. Strapp was the maiden name of his mother, Elizabeth. His father, also named Christopher, was a meat merchant, presumably a wholesale butcher. The Poulters enjoyed a comfortable life, with a live-in domestic sevant. However, mother Elizabeth died during the 1880s, when Christopher was only a teenager. Poulter worked from his teen years onward as a clerk to shipping companies. He married Emilie Henriette (last name not known) in 1899, with whom he had three children. In 1895, when he joined the QMC, Poulter lived at 57 Belvedere Road, Upper Norwood, London. He was still at that house in 1897. The 1999 and 1901 QMC Member lists give Poulter’s address as Hogelund, Clyde Road, Wallington. The 1901 census similarly listed the family at 1 Clyde Road, South Beddington, Wallington, London. 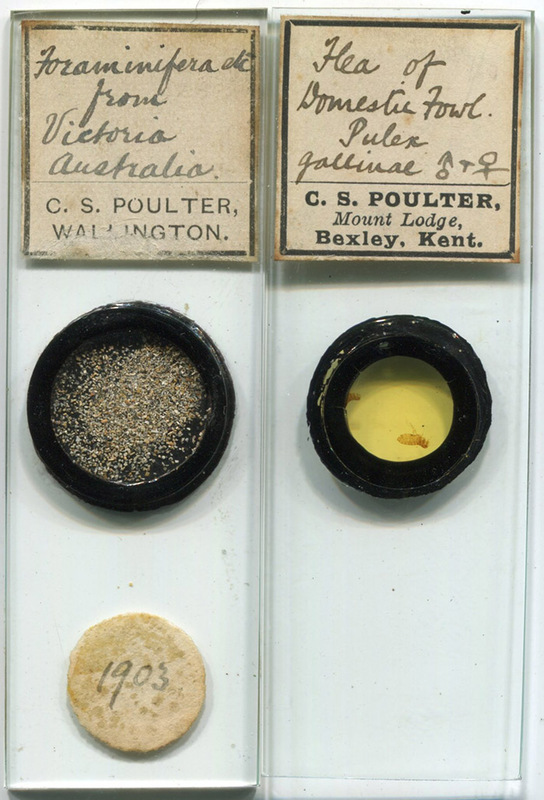           Poulter’s earliest known slides have labels with the Wallington address (Figure 1). He sent some unmounted material to the editors of Knowledge in 1904, who reported: “Microscopical Material - By the kindness of Mr. C.S. Poulter, of Wallington, I am able to offer to the microscopical readers of Knowledge some leaves of Deutzia scabra, showing stellate hairs, and of Elaeagnus edulis, showing peculiar scales. Those who desire to avail themselves of this material, should send me a stamped addressed envelope, together with the coupon appearing in the advertisement columns of this journal”. By 1904, the Poulters were living at “Mount Lodge”, Parkhurst Road, Bexley, Kent.     Microscope slides are known to carry that address (Figure 1). He lived at Mount Lodge until the end of his life, passing away on November 7, 1930. Figure 2. 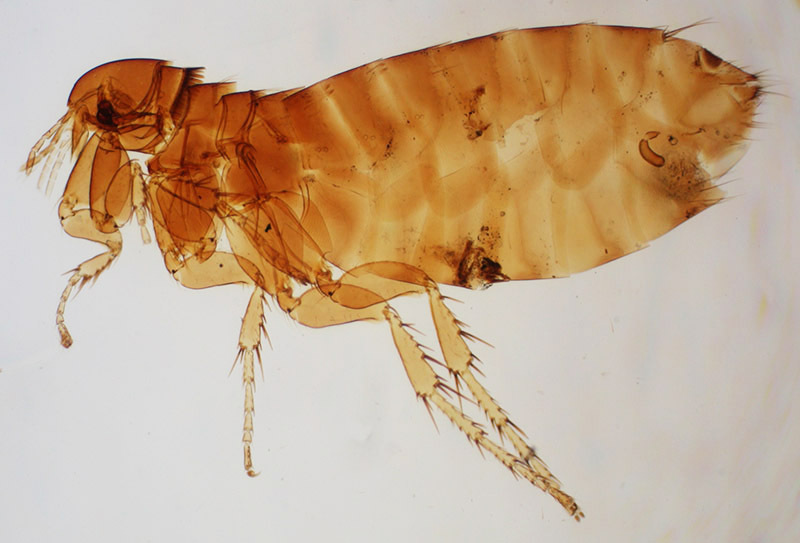 Hen flea, Ceratophyllus gallinae, prepared by C.S. Poulter. Photographed using a 3.4x objective lens and C-mounted SLR camera.